I am spending this weekend in Maryland visiting my friend Carlea, who is not only a fantastic hostess but also quite an enabler when it comes to my dorky obsessions like this website… So she was more than happy to accompany me in my search for some local veggie burgers in her hometown. 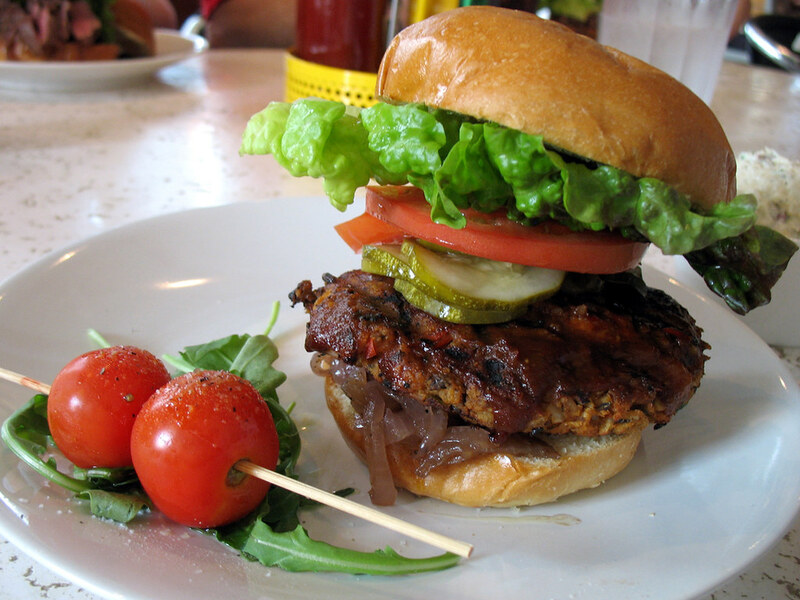 Punk’s Backyard Grill had come up in a few online searches for “veggie burgers in Annapolis”, with some promising reviews for the quality of said burgers. I had not realized it was in a shopping mall - but there it was right along with Applebee’s, CPK, the Cheesecake Factory, etc. (The entrance is on the outside though, so you can go straight into the restaurant and avoid the mall itself). The menu describes the burger as “made in-house with fresh vegetables, black beans, savory spices, and brushed with barbecue sauce”. According to the kitchen staff, the patty is dairy-free, but contains eggs. Topped with onions (they asked me if I wanted fresh or carmelized – I picked carmelized, of course), lettuce, tomato, and delicious pickles. And it tasted great. 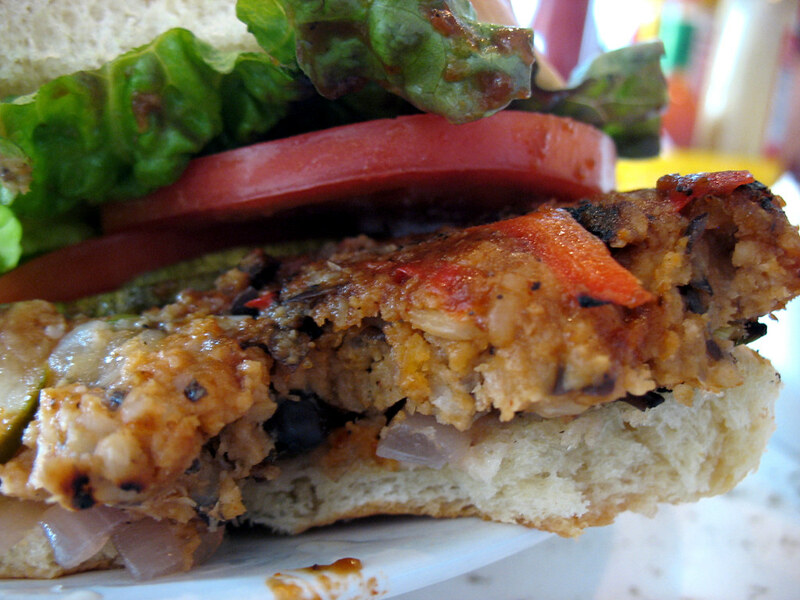 The patty itself was a nice combination of veggies, rice, barley, and a good amount of black beans – crispy on the outside, soft on the inside – but the barbecue sauce was what really completed the whole thing. Yummy. The bun was about average - it tasted almost like potato bread, but I'm not sure. The pickles and tomatoes kept sliding off as I was eating it, but I kind of enjoy the messiness of a burger when the flavor is as good as this. Note that the burger does not come with fries - actually they do not even serve fries at Punk’s! Apparently this is to go with the “backyard barbecue” theme. So I ordered a small potato salad as a side (extra cost), which was tasty and a nice change of pace anyway. Carlea would like me to add that, as an omnivore, she enjoyed her flatiron steak sandwich, and the sodas served at Punk’s are corn syrup-free (definitely noteworthy). But we found the acoustics of the restaurant amplified noise a bit more than you would expect in dining situation, making conversation a little difficult. That burger looks huge, too bad they don't have a Vegan version. I live in Baltimore County, Maryland. Annapolis is about 50 minutes away from my location. I rarely go out to eat, I much prefer cooking myself, but occasionally I do venture out to have food with friends, although they usually just end up stopping by my place. too bad it contains eggs (for us vegans). i went to a restaurant in kc where the menu states the veggie burger is served on a 'vegan friendly bun', but when i asked, the patty had eggs. what's that all about? that is the weirdest restaurant logic I've ever heard, miss v! although I did once refuse to order a dish that had fish-based sauce in it, and the waiter gave me a weak little smile and asked "can't you just pretend it's vegetarian?" um, no. Hi Dave, thanks for the comment! And to clarify - your staff didn't seem confused about the difference between vegan and vegetarian, they were very upfront about the fact that the burger contained eggs. I definitely appreciated that.